Tooth loss affects the majority of adults in the United States to some degree, but many of them bounce back with full, brilliant smiles with the help of partial and full dentures. Consisting of custom-made, lifelike replacement teeth and a comfortable, form-fitting plastic base, full dentures replace every tooth on the upper or lower dental ridge. If you still retain several healthy teeth, then Dr. Folck or one of our associates can suggest a partial denture that fits around them and replaces teeth only where necessary. Replacing lost teeth is necessary for several reasons, including restoring your smile’s healthy, youthful exuberance. Dentures also help rebuild your complete set of teeth so you can once again eat your favorite foods and smile with complete confidence. If one or more teeth must be extracted first, then we can place an immediate denture on the same day as your scheduled tooth extraction. Placing a partial or full denture begins with a comprehensive examination using advanced imaging technology, including digital X-rays, to determine the best option. The images and measurements will be used to craft a partial or full denture (depending on the extent of your tooth loss) according to your unique specifications. Once your prosthesis is completed, we will make sure it fits properly. For increased support, partial dentures are also secured with hidden clasps, and we will ensure a comfortable fit before securing it into place. For many patients, we may recommend supporting their denture on a series of dental implants. The small implant posts offer unmatched stability for a partial or full denture and mimic the roots of natural teeth. 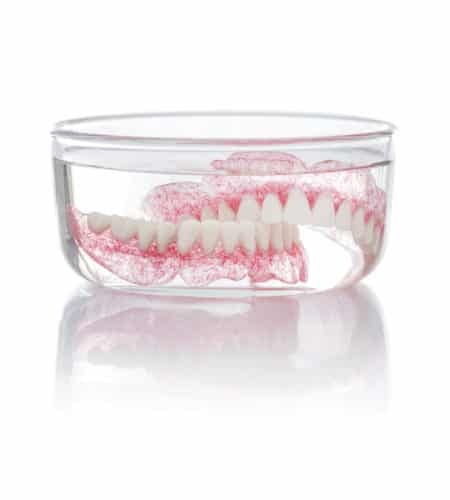 Modern dentures are customized to fit every patient’s specific needs. To find out how a partial, full, or implant denture can help you, call Absolute Dental Care today at (757) 428-7440. Located in Virginia Beach, VA, we also proudly welcome patients of all ages from Chesapeake, Norfolk, Suffolk, Hampton, Eastern Shore, and all surrounding communities.